Tunisia has a long Jewish history - Jews were present in North Africa before the arrival of Islam or Christianity. In good times they prospered and in hard times they bore the brunt of discrimination, but now they are at risk of extinction. Of 100,000 before the creation of Israel in 1948, only about 1,500 are left. After the revolution that ousted President Zein al-Abidine Ben Ali last year, there have been ominous signs. More than once, hardline Salafists have staged demonstrations shouting "Death to the Jews". This has alarmed many in Tunis's tiny Jewish community. But while he is gloomy about the future he is also a dreamer, and the centrepiece of his dream is a small villa in the seaside suburb of La Goulette. The white two-storey colonial era house has a blue metal gate that carries a big sign - Mamie Lily Restaurant. Lily is his 85-year-old mother and the master chef. "She is the heart and the memory of Jewish cooking in Tunisia," says the chain-smoking Lellouche. He left Tunisia in 1978 to study marketing and economics in France but decided to return to his roots in 1996, to live with his mother and to found "the last kosher restaurant in Tunisia". "I want to invite my clients to a cultural trip… to an old Jewish house with a Jewish mamie in the kitchen," he says. "When she speaks to the clients it's like a Jewish mother speaking to her kids. 'Don't put salt on this, it's not good… No, it's enough, you don't have to eat this or that,'" he adds, letting out a croaky laugh. Lellouche says there are traces of Jewish culture everywhere in Tunisia, in music, handicraft, literature and names. He hopes that all Tunisians will one day become aware of their common culture and history regardless of their religion. In the kitchen, Lily sits on a low stool. In front of her is a big bowl of okra - the dish of the day. She has sparkling brown eyes, a deep voice and an unmistakable air of authority. Like most Tunisians she mixes Arabic with French freely. How is life in Tunisia today, I ask? Why was it better before? The emergence of the hardline Salafists - a brand of Islam practised in Saudi Arabia which adopts a literalist interpretation of the Koran and preaches strict separation of the sexes, and rejection of Western lifestyles - has taken everyone by surprise. By all accounts they are a tiny minority, but they are vocal, active and prone to violence. Lellouche foresees the end of Jewish life in Tunis - though he thinks it will survive on the island of Djerba in the south. A few blocks away from Mamie's restaurant is Beit Mordechai, a small modern synagogue that is difficult to distinguish from the other residential houses on the narrow street. When I arrive during the evening prayer the atmosphere is warm and informal. The grown-ups are praying, the kids are running around. It's a small congregation and someone has prepared a cake to share after the prayer. Ellie Attoun, a 39-year-old businessman, is originally from the south, but during the Israeli invasion of Lebanon in 1982 there were demonstrations against the Jews there and his family relocated to the capital. He says he was optimistic when the revolution broke out last year, the first episode of the Arab Spring. "At the beginning we wanted to see Tunisia open, modern with all what we see in Western Europe. We wanted to look like the modern world. But unfortunately, a few weeks and months after there's a small part of Tunisian people [who] are against the modernism that the big majority of Tunisian people want." One of his concerns now is that "we don't see a real will from the government to act against those people". I put those concerns to the leader of the Nahda movement, Rachid Ghannouchi, the mainstream Islamist party that leads the current coalition government. Ghannouchi says Tunisian law prohibits incitement to violence against any group, and that he has reassured representatives of the Jewish community that those responsible will be tried. No-one has been tried yet, he concedes, but it took America 10 years to hunt down Bin Laden, he points out. Nahda's attitude is regarded by some Tunisians as a form of double-speak. They accuse it of paying lip service to democratic values - freedom of expression, equal rights to all citizens, rule of law - while in reality having much in common with the ultra-conservative Salafists. 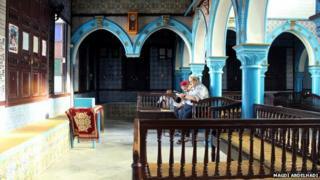 On Djerba, the heartland of Judaism in Tunisia and home to one of oldest synagogues in the world, El-Ghriba, the Salafists do not seem to have a presence, but the news of their threats has reached the small Jewish community. A Jewish man, a 53-year-old father of six, says he has seen "Death to the Jews" scrawled on the wall. He writes over it "Death to those who want death to the Jews," he tells me. He lived in the West for nine years, but he came back, he says, because he loves his traditional lifestyle. Whisk oil, water and tomato puree and pour into a large casserole. Add lamb, onions, celery, carrot, garlic and cinnamon. Bring to the boil, cover and simmer for 30 mins. Add broad beans, leek, artichokes and courgettes. Bring back to the boil, cover and simmer for at least another 30 mins. Add spinach, allow to cook down, then add the fresh herbs, leaving some for garnish. Add harissa or cayenne pepper to taste. Place the pieces of matzoh on top of the stew and press down gently. Sprinkle with reserved herbs before serving. By Clarissa Hyman. Full recipe and list of ingredients on BBC Food. I ask him what he feels about the future. He say it is all in the hands of the government - if it creates safety and stability then the Jews have nothing to fear. None of those I asked said they wanted to leave Tunisia or have made such plans. But none of the 800,000 or so Jews who used to live in Arab societies before 1948 had wanted to leave. In most cases theirs was a forced departure. The majority went to Israel, while some 200,000 fled to the West. Now, it is thought there are less than 20,000 left. At the synagogue in La Goulette, Attoun tells me he has studied in France but, unlike other members of his family, he returned through love of his homeland. Part of his extended family live in Israel, but personally he has no plans to go anywhere. "We are only Tunisians, me and my children. For us Tunisia is our country. We don't want to imagine the catastrophic scenario." Magdi Abdelhadi's documentary, Arab Jews: A Forgotten Exodus, was broadcast on BBC World Service. Listen to the programme via i-player radio or download a podcast.